This week’s schedule is gonna be a bit off. Sunday night when I went to read Freex #4 to get that post going, Sarah (the cat) came running right over and laid down on the comic. She stood up a bit when I asked her if I could read the one under it instead (Prototype #3) and she then laid right back down on ’em. Then Monday she pulled the same basic act on me while I tried to dive into some homework–standing between me and the tablet I’m watching course videos on, laying on my papers, etc. I took that as an excuse to procrastinate further, and ran some errands and such. Long story short…this barely-counts-as-today post is showing off recent acquisitions that I haven’t shown off yet. Two Silver Surfer volumes; both Epic Collection books. Silver Surfer: Thanos Quest ("vol. 6" collecting the Silver Surfer) and Silver Surfer: The Infinity Gauntlet ("vol. 7"). 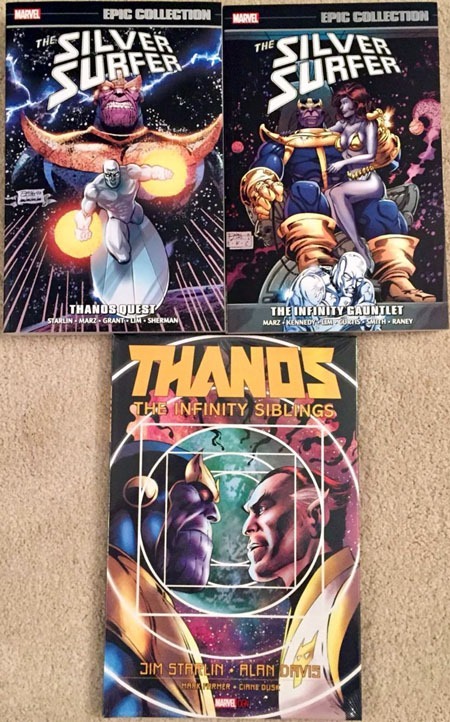 And the latest (and unfortunately final, I believe) Thanos OGN by Jim Starlin: The Infinity Siblings. I’ve been interested in the Silver Surfer: The Infinity Gauntlet for quite awhile now–since it came out whenever it was last year or late 2016. 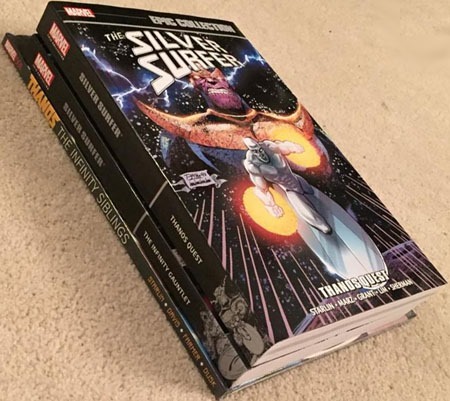 Noticing the recent-ish release of Silver Surfer: Thanos Quest as well as being aware of the Infinity Siblings book prompted me to order all 3, to be "caught up." 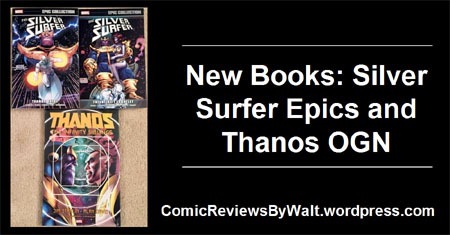 I had been thinking that the Epic Collection was an "upgrade" on Thanos Quest–I still have a squarebound comic issue that reprinted the two issues from 1999 or so (I believe around the time of The Infinity Abyss). And I’ve long had Silver Surfer: Rebirth of Thanos that has several Silver Surfer issues and the 2 issues of Thanos Quest. I was pleasantly surprised to realize that the only overlap actually is Thanos Quest itself–the Rebirth of Thanos volume has Silver Surfer 34-38 in it; then the first Epic has 39-50, and the second Epic has 51-66. 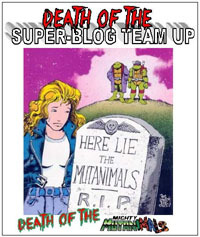 33 issues across 3 volumes, plus two instances of Thanos Quest, and various other material. I suppose it’s more of a "Jim Starlin shelf," though there’s a bit of stuff in there that I don’t think he was on–namely the Avengers vs. Thanos and Thanos: Cosmic Powers (though I could be wrong–memory is fickle). And of course the novel by Stuart Moore. But to me, by and large, Thanos is Jim Starlin, and his vision/use of the character is THE character. All this Infinity ____ stuff, and I’ve no interest at present in the Infinity event with all its tie-ins. 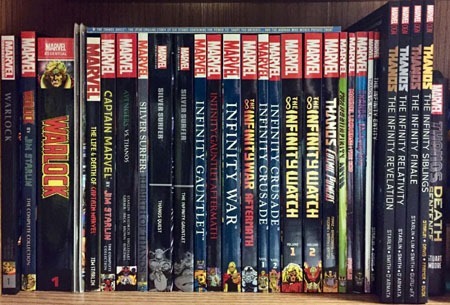 And while it’d be sorta cool to have the Infinity Gauntlet Omnibus, I’m losing my taste for the far-too-large-to-be-practical omnibus volumes, preferring "deluxe hardcovers" and "fat paperbacks" to actually be able to handle and read. So…new books, and the shelf with them now inserted!